Chicago | Reuters — U.S. wheat futures dropped 2.5 per cent on Tuesday to a one-week low after Russia’s agriculture ministry said it had no plans to restrict grain exports from the world’s biggest wheat supplier, traders said. Corn firmed on support from news that Argentina planned to impose a 10.2 per cent export tax on the grain, which could boost overseas demand for U.S. supplies. Soybeans ended slightly firmer after trading in both positive and negative territory during the session. Russia’s agriculture ministry does not see a need to impose export duty or curb grain exports in any other way, it said in a statement after a meeting with exporters on Monday. The news had pushed European futures lower on Monday, and the reopening of U.S. markets on Tuesday after Monday’s Labour Day holiday added to selling momentum. A firm dollar, which added to the likelihood that the U.S. will remain the global supplier of last resort, further pressured the wheat market. The gains in the dollar stemmed from worries over emerging markets and the U.S.-China trade standoff. Dollar strength makes U.S. supplies of wheat relatively more expensive to overseas buyers. “We won’t get big, consistent (export) business until the rest of the world is definitely out of wheat,” said Mark Schultz, chief analyst at Minnesota-based Northstar Commodity Investment Co.
Chicago Board of Trade December soft red winter wheat futures dropped 14 cents to $5.31-1/2 a bushel (all figures US$). 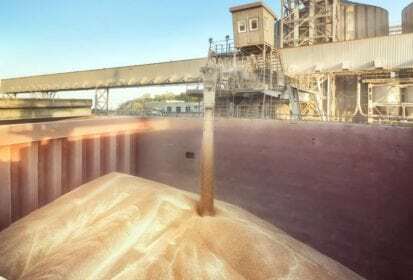 A sharp expected fall in Russian wheat production and fast exports at the start of the season have fuelled speculation that the world’s top wheat supplier would limit flows. The news from Russia overshadowed developments in Argentina, where growers and consultants said farmers may delay wheat sales and plant less corn this year after the government announced a roughly 10 percent export tax on the grains as part of an austerity program. CBOT November soybeans settled up 3/4 cent at $8.44-1/4 a bushel. CBOT December corn was 3-1/4 cents higher at $3.68-1/4 a bushel. Corn, which hit its highest since Aug. 23, closed near session highs.